OR – What Will You Do With All That Extra Money and Time! A Recording of a Live Tele-Seminar. This 2 CD or cassette program will help you learn what it takes to be a keynote speaker and if keynote speaking is right for you. 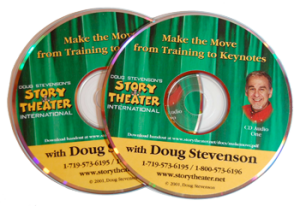 Doug covers the main differences between training and keynotes; which training skills transfer to the keynote platform; the biggest mistakes trainers make when presenting a keynote; and how to make the move into the keynote market. Also included: a pdf downloadable handout for this program. Please download the handout within 24 hours after purchase.